Mayson Jars & Graham Crackers: Happy Birthday Graham! Our lives have been pretty hectic lately. Mayson is having a blast in school right now. They do a summer program with activities planned everyday. Her favorite is Splash day of course, but snowcones are a close second. She got her first pet this weekend too. It's a red Beta fish named "Charlie" She is obsessed with him. She checks on him all day long. Mommy and Daddy are a little worried about Charlie, he hasn't eaten anything and at times he seems to be just "floating" along... not sure how many "Charlie's" there will be when it's all said and done. Petsmart gaurantees the fish for 14 days and I think it might come in handy. 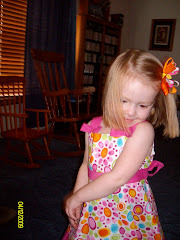 We go to the doctor on Friday for both kiddos, Mayson's 3 yr. checkup and G.W. 's 4 month. That should be interesting since they both get shots. Wish us luck! At least Danny is off and gets to go with me to help. And on that note... I have the greatest husband in the world!!!! He has been such a trooper since I've been back at work. Especially putting up with our long summer hours right now. He is my best friend and I could never imagine going through our crazy life without him. I love you Honey! Okay, enough sappy talk, let's get on with the latest pictures! This is Graham visiting his great Grandad (the original G.W.) and Grandma (Danny's Grandparents). 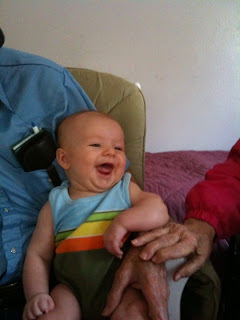 Granny took this picture so of course the grandparents got cut out and we just focused on the rotten grandbaby! After bathtime. Mayson loves to help put lotion on her baby brother. 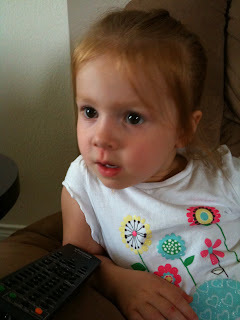 This is my little monkey zoned out watching T.V. A bad habbit that we need to break but sometimes mommy and daddy just need another hour of sleep. 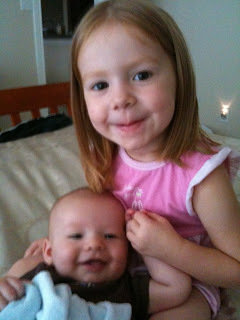 Mayson and Graham, my two precious angels. I am thankful every day that God gave us such wonderful gifts! 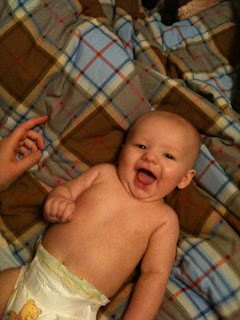 And to end this blog with a video of my little munchkin talking to me and telling me all about his day after bathtime. (Ignore the annoying voice talking to him) You know you all do it too! I love those sweet babies! 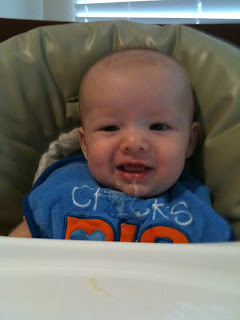 I can't beleive that GW is 4 months already! He is such a big boy! I can't wait to get to see them everyday again! Love you all! Wow! Mayson looks just like you! She is adorable and so is little Graham. What a great family. Hey, thanks for the advice! I will definitley try that! 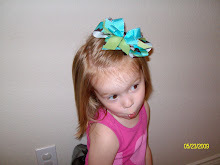 Your kids are adoreable and is seems like are girls are pretty close in age! Oh and I love the name of your blog, so so cute!